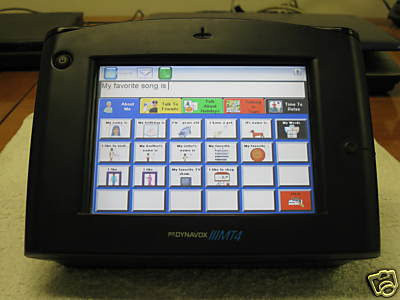 For now Nea will be using a DynaVox DynaMyte, a touchscreen 3 pound talking thingie with multiple screen levels. We toured the Tango at Easter Seals recently (they have action videos on their web site if you are interested). It's flashy. It's cool. If Nea was never going to talk, I would be twisting arms to get her one. Twisting hard. But it's too cool, I think. You go to the breakfast menu (using nice big pictures). You click the picture of oatmeal. It says "I would like oatmeal, please." with excellent inflection. But even though the crappy talker we have makes you use 3 pictures to say "I" "want" "oatmeal" using two different screens, I think that's better for her. Make her work for it, I say. Anyway, it belongs to the school. If we lose or break it, we owe $7000. I'm thinking about calling our insurance to have a rider put on our home insurance for it. It's unbelievable how, quite frankly, crappy this product is. For a tenth of the cost, we SHOULD be able to get an older laptop and some software. There's something really wrong with a world where this is the best we can do for our non-verbal children at that price. The Tango is also $7000. What a coincidence. OK. That's my last post about apraxia for awhile. Unless I tell you the story about how Nea managed to ask my overweight non-gestating coworker about her pregnancy using only gestures and the word "baby." That was a special moment for me. 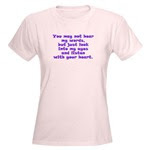 If you can't read that, it says "“You may not hear my words but just look into my eyes and listen with your heart." Makes me all weepy, it does. yes please. i want to hear the story about the non-gestating coworker. again.